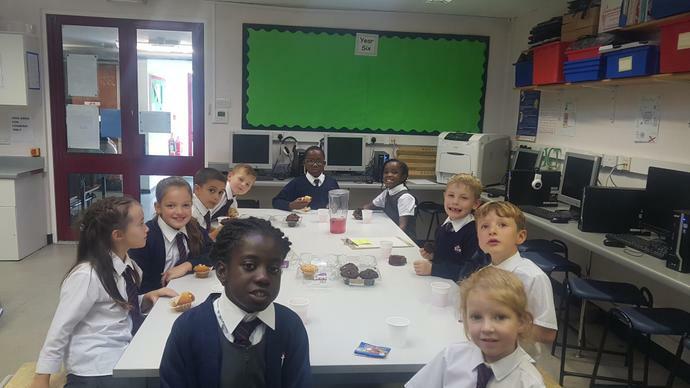 10 children came to my tea party this week. Some were chosen for wonderful work and behaviour in class and the others came as they have their amazing writing displayed on our ''WRITING WALL OF FAME''!!! Year 6 were busy visiting the Church as part of their history topic so will be coming next week instead. These children came today and enjoyed treats and squash. Imogen (Y1) Having a positive attitude towards school. Zach (Y1) His writing is on our 'Wall of Fame'. Joshua (Y2) A good attitude to work. Angelina (Y2) Her writing is on our 'Wall of Fame'. George (Y3) Working very hard in maths. Andrei (Y3) His writing is on our 'Wall of Fame'. Hezekiah (Y4) For good concentration and independent working. Hannah (Y4) Her writing is on our 'Wall of Fame'. Rehoboth (Y5) Excellent topic homework. Ava (Y5) Her writing is on our 'Wall of Fame'.